This is the latest UAAP Season 75 Women’s Volleyball Stats Leaders as January 26, 2013. Jem Ferrer of the Ateneo Lady Eagles is the leader in the best setter category. She’s being followed closely by FEU Lady Tamaraws’ Gyzelle Sy. 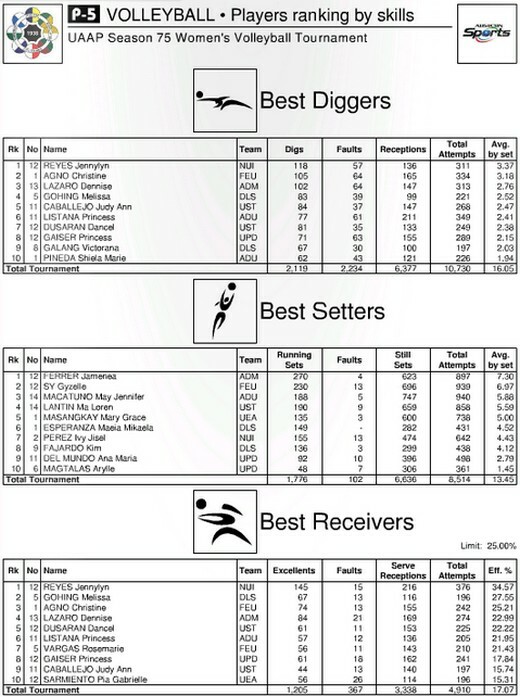 NU Lady Bulldogs’ Jennylyn Reyes on the other hand is the leader in the Best Digger category. Christine Agno of the FEU Lady Tamaraws is right behind her. And in terms of being the best receiver, Jennylyn Reyes is once again at the top followed closely by miss Melissa Gohing of DLSU. HI! would you happen to have the latest stats on best spikers, scorers, blockers, servers??? Thanks!